After the success of its Litho device, Quanta System proudly widens its offer in lithotripsy for the most demanding customers with its first-class 60W and 105W Holmium solutions, Cyber Ho, further entering the HoLEP world. 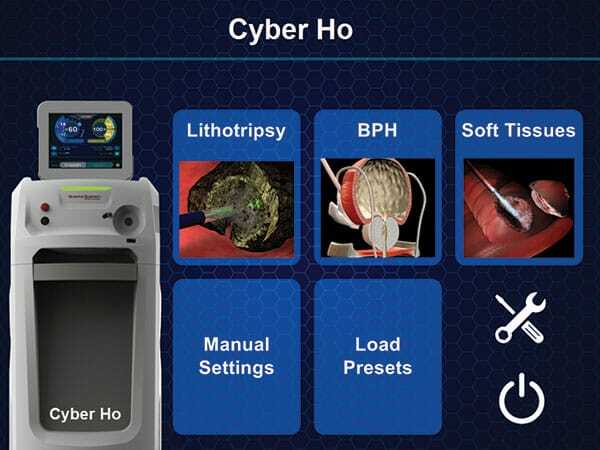 Cyber Ho meets the increasing demand in matching efficacy, flexibility and cost-effectiveness combining all of these in a unique multi-application laser platform able to perform both lithotripsy and HoLEP. Cyber Ho brings outstanding innovation by offering the exclusive MasterPULSE technology for retropulsion control, plus energy and frequency (up to 60Hz in 60W and 80Hz in 105W) settings generally out of range for other laser devices. These groundbreaking advantages merge with the superior quality and reliability the Quanta System brand is renowned of worldwide. When it is operating in a short pulse emission mode, it is highly effective in the fragmentation of calculi and the hard tissue ablation. In long pulse emission,it is highly effective in cutting soft tissue providing excellent hemostasis and coagulation with minimal damages of surrounding tissue, due to its low penetration depth. Because of its high water absorption, the application in a hydrous solution environment is highly safe. · Dusting – Long Pulse: the vapor tunnel generated by long pulses allows efficient stone ablation. · Dusting – High Frequency: energy is released in smaller amounts with a higher repetition. 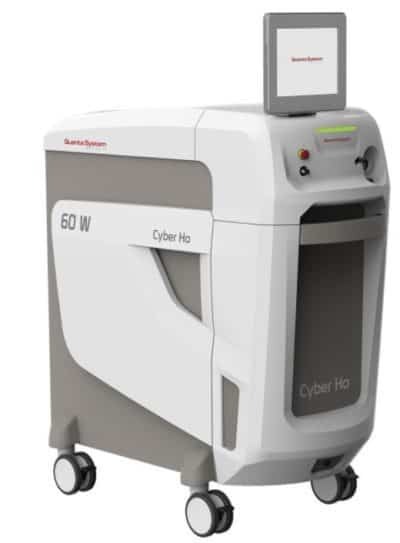 Cyber Ho outclasses the other 50-100W Holmium systems in terms of settings for stone treatment. In short, Cyber Ho offers greater settings and enhanced versatility with respect to Holmium devices with similar or even higher power for a smarter expense. 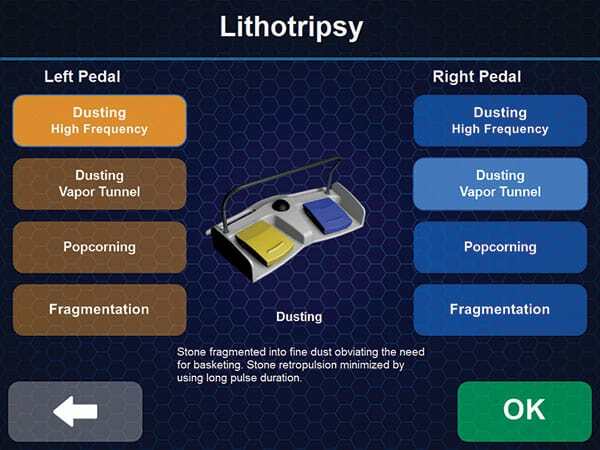 Quanta System introduces a new application setting: the Lithotripsy DUSTING EFFECT. This preset Application is inside the main application menu, beside Lithotripsy HARD STONE, Ablation and Coagulation. HoLEP (Holmium laser enucleation of the prostate) has almost replaced TURP in BPH treatment. Strong clinical evidences and long-term investigations demonstrated the reliability, safety and effectiveness of HoLEP. The 60W output is your perfect ally to complete a gentle and fast adenoma enucleation in any size of prostate. 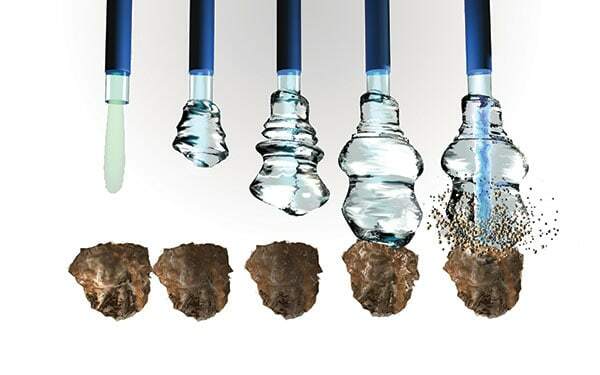 The MasterPULSE technology revolutionizes the concept of lithotripsy by granting complete control over stone retropulsion, avoiding the bothersome and time-consuming fetching of targeted fragments. Advanced lithotropsy with the Vapor Tunnel mode. Choose the traditional Long Pulse Dusting or take advantage of Cyber Ho’s impressive 60Hz frequency to perform a High Frequency Dusting lithotripsy. Not acquainted with Holmium lithotripsy and its settings? Quanta System knows your concern about using wrong or ineffective parameters and can guide you to a safe and correct emission adjustment. Cyber Ho was designed for those struggling with finding a system able to perform effectively both BPH and stone treatments, with also excellent results in treating urinary carcinomas and strictures. Avail yourself with larger parameter ranges in terms of frequency and pulse energy, widening your choice of treatment and tailoring the procedure to patient needs. Thanks to the double footswitch, you can switch instantaneously from a 60W cutting emission to the coagulation mode, or from dusting to traditional fragmentation. Enough with struggling in finding a good parameter combination to avoid stone instability and renouncing to have both effectiveness and ease of treatment! 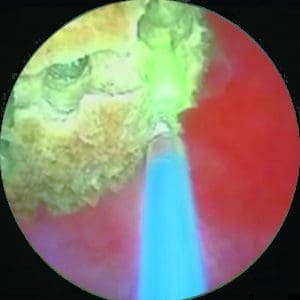 Cyber Ho is the ONLY laser device providing complete control over stone retropulsion. Simply regulating the intuitive retropulsion bar, the user can quickly tune laser emission according to his visual feedback. This exclusive feature cuts down treatment time and simplifies setting adjustment, enhancing treatment effectiveness. Specific high-energy long pulses develop a vapor bubble connecting fiber tip to stone surface (vaporization of water in between). Once the bubble reaches the stone, ablation occurs by direct transmission of laser energy. As the bubble has not collapsed in the meantime, retropulsion is prevented. As world leaders in the field of Holmium lithotripsy, we know how often inexperienced surgeons are in need of some suggestions regarding device settings to start the treatments with. Quanta System further understands the importance of having user-friendly systems in order to achieve satisfactory and fast treatments. The S³-Mode (Smart Selection of Settings) was born as guided modality to enhance user experience and to make Cyber Ho the best laser solution regardless of your experience with Holmium laser. ARE YOU ALREADY EXPERIENCED IN HOLMIUM LASER? Skip the guided selection and start immediately the treatment by choosing the manual settings. HAVE YOU FOUND YOUR FAVORITE EMISSION SETTINGS?